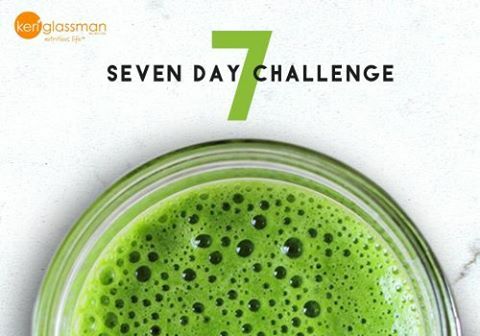 7 DAY EAT YOUR GREENS CHALLENGE! 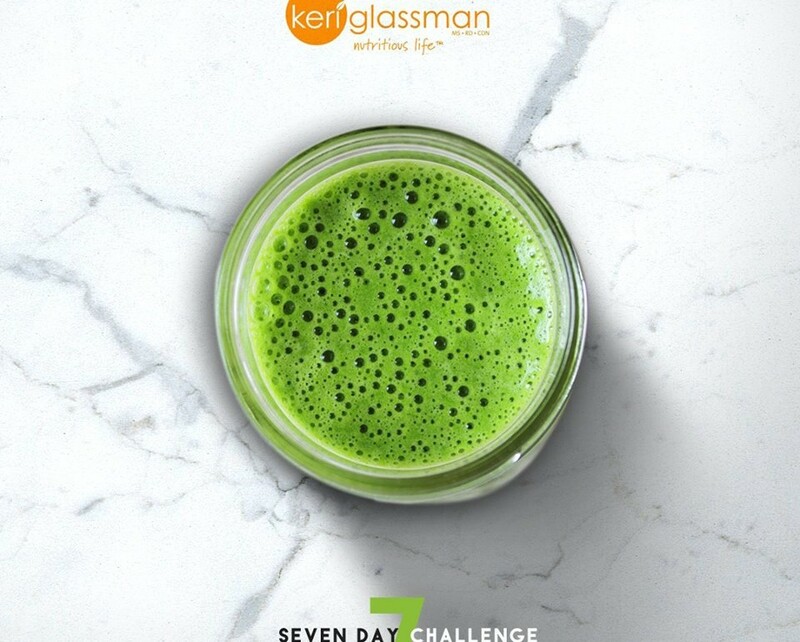 My Nutrition Coach Keri Glassman of Nutritious Life hosted a 7 Day Eat Your Greens Challenge and I want to share this with as many as I can to participate too! 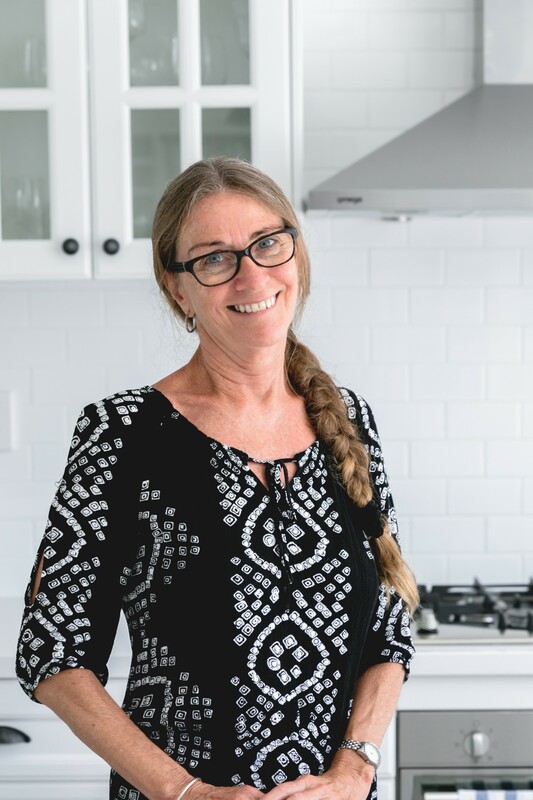 I know how important it is to “Eat Empowered”, one of the 8 pillars of health she teaches. So many of us still have a childhood attitude when it comes to eating our GREENS! It is time to expand on our nutrition and add more healthy GREENS into our everyday meals. Are you READY to “Eat Empowered”? FOR ONE WEEK, ADD IN ANY GREEN VEGGIE TO ONE MEAL EVERY DAY. Head to the farmers market or your local store, peruse the produce, load up on greens (at least three varieties!) and plan for the week. Broccoli, kale, spinach, green beans… the options are plentiful! Decide when and how you’re going to incorporate your greens. Spinach breakfast scramble anyone? Sautéed green beans with toasted walnuts as side to dinner? Write it down, and be sure to get greens in at least one time today! Review your plan and do some prep for the week. Chop kale for your go-to salad, wash and chop broccoli for dinner. If you’re saying, “time, yeah, right” then order a side salad when ordering in, and remember that bagged, pre-washed organic lettuce is a life saviour. Research delicious, new, simple recipes to try. Find a new instagram account to follow, crack open an old cookbook, or post something on social to get your peops to inspire you with ideas. New to the Green Smoothie Craze, or looking for an easier way to sip your greens? Try the new Clean Greens Blend. Just add one scoop into a glass of water or Coconut Water and boom, check greens off your to-do list for the day. Today, take it up a notch and experiment with a new type of green – try baby kale for your salad, or bok choy to make your wrap, rocket in your scramble, Brussel sprouts for a dinner side dish, or zucchini as your hummus dipper. Replace a starchy side dish with a green side dish. If you’re eating out, ask for double greens instead of greens and a starch get a side dish of green veggies. This is personal fave of mine. 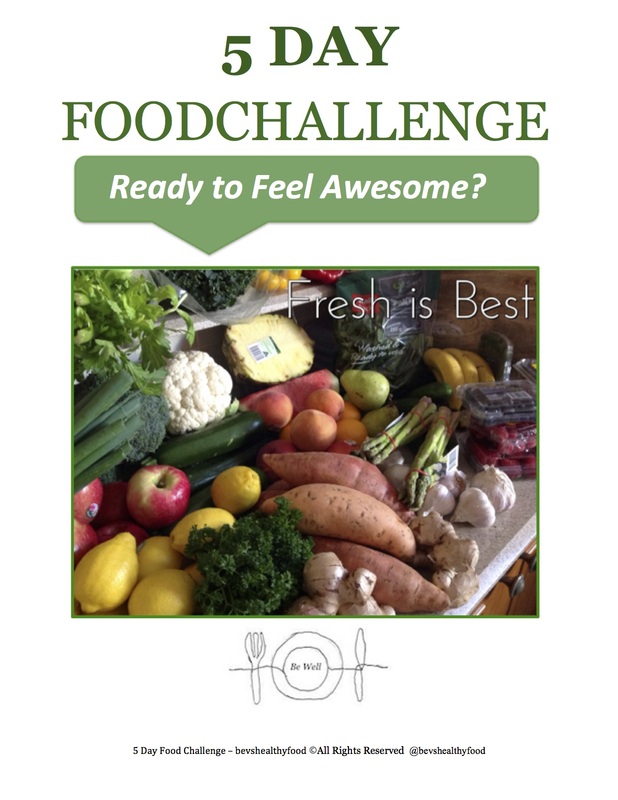 A great way to get in a whole lotta greens and an even better way to ditch refined, often fat and sodium laden starchy foods that are doing your body a whole lotta nothing! You did it! Congratulations on packing in your greens. I bet you feel good about it don’t you? Tap into that feeling and keep it up! Avocado, anyone? Greens Fight Disease. Green veggies offer a powerful dose of fibre, vitamins and minerals including antioxidants and phytochemicals, which have been shown to lower cholesterol, prevent heart disease and may help reduce the risk of cancer. The carotenoids in leafy greens act as antioxidants, slowing free radical damage. Fill Up Til You’re Full. Leafy greens have a high water volume, which helps you stay hydrated. One study showed subjects’ metabolic rate increased 30% within 10 minutes after drinking 500ml of water. Their high fibre content not only leaves you feeling full for longer, it also helps keep things moving in the GI tract. Promote Skin Health. Phytochemicals and antioxidants in green veggies can help protect your skin against UV damage by countering free radicals in your body to lessen the deterioration of skin’s vital components like collagen and elastin. Say hello to greens and say hello to gorgeous skin. You may just pay a few less visits to your dermatologist. Sip Green. While you’re embracing your green veggies, add a cup or two of green tea a day to keep up with the theme! You’ll get an extra kick of antioxidants. Not feeling tea? 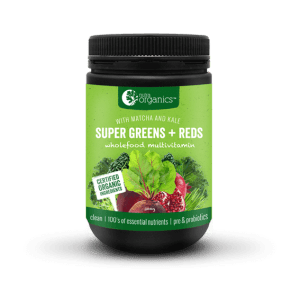 Try Nutra Organics Super Greens & Reds Blend. Note: A serving of greens is either 1 cup raw or ½ cup cooked and I want you to get at least this much in at every meal and hopefully more! Remember a salad for example could be 2 cups and your side with dinner could be 1.5 cups! Let me know how you do, leave a comment below.